Summary: A study on SMOs: their operations, funding, and impact. Small and medium-sized organizations (SMOs) play a crucial role in international development and public engagement across Canada. Specialized, well-connected, and flexible, SMOs directly reach and engage with Canadians. They operate in our cities and communities. Their impact stretches beyond our borders and into the poorest countries in the world. This study considers the value and contributions of small and medium-sized Canadian civil society organizations in their role as development actors. The research reveals the scope and untapped potential of many groups from coast to coast to coast, and draws attention to the impact over the last decade of changes in federal funding strategies on this important sector. The paper also surveys the impact of changing funding structures and political climate on the ability of SMOs to conduct their impactful work. By outlining where SMOs sit in the Canadian international development sector, this paper will spark a discussion about re-engaging SMOs in Canada’s development efforts at home and abroad and will strengthen calls for a funding mechanism for SMOs at a national level. 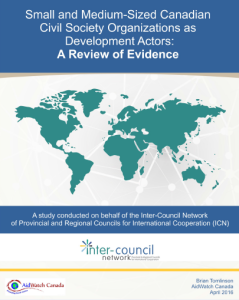 This research study was commissioned by the Inter-Council Network of Provincial and Regional Councils for International Cooperation (ICN), and undertaken by AidWatch Canada.